Inspired to find out how most of their cells were made up of corn, this Boston-raised duo had something unusual in common: both of their grandparents had worked as farmers in the same little county in Greene, Iowa. 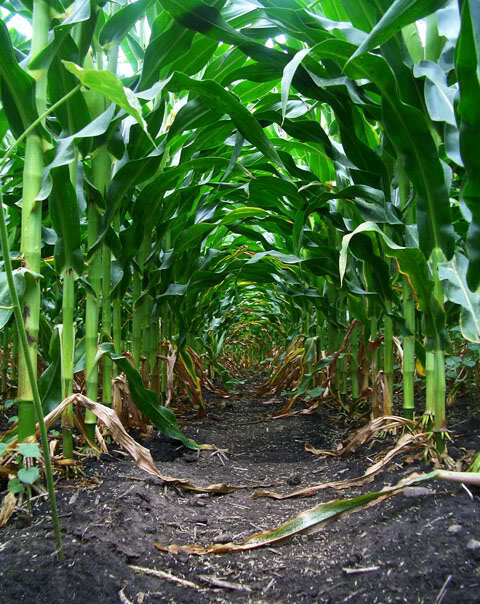 How fitting is was that they should take the experiment back to their ancestral stomping grounds, so they contacted Chuck Pyatt, a corn farmer from Greene, who then granted their request to plant 1 acre of corn on his land. [Movie not showing up? Go here. In 1973, Secretary of Agriculture, Earl L. Butz, put the Agriculture and Consumer Protection Act (a 4-year Farm Bill) into play and replaced the old government programs of curtailing (paying farmers to not produce), with Farm Subsidies (listen to podcast here; more on Farm Bill here), which supplement a farmers income with deficiency payments. For the 1 acre that Cheney and Ellis farmed, they received $28 from the government for it. After purchasing ammonia fertilizer, Liberty pesticides, renting farming tools, and selling their corn, they actually made: negative $19, despite the Farm Subsidy direct payments they received. Thus the thinking might logically be, farm more corn to make more profits. Farming has become a large-scale business. As farmer Rich Johnson says, "You've gt to be pretty good sized or you kind of get squeezed out." When the two farmers-in-training did a taste-test on their crop, they responded with this: "It looks good...It's not very good...It tastes like saw dust...I really thought it would taste better." After the harvest, Cheney and Ellis wanted to find out where their corn would end up. It was virtually impossible to specifically track their corn, but the the statistics said that 32% would either be exported overseas or turned into ethanol, 18% would become sweeteners—like high fructose corn syrup, and 50% would be fed to animals and become meat products. As half of their corn would be feeding the meat industry, they did a little sleuthing and found that most cattle in the beef industry are sent to feed lots for their last 140-150 days, where they spend their time in confinement, hardly moving and eating up to 90% of their diet in corn, much of which comes from a by-product in the ethanol-making process. This allows them to put on weight quicker and compete in the beef market. Cattle rancher, Sue Garrett explains that it takes several years to reach market weight for cattle that are grass fed on the open range. She further says that once a cow goes past 120 days of being fed a high-corn diet, the cattle's health begins to rapidly diminish with ulcers and can lead to death. According to Allen Trenkle of Iowa State University, cattle have gone from no grain in their diet to consuming up to 90% of their diets in grain [corn]. This change causes the livestock’s PH levels to drop and develop acidosis, which occurs when more acids are produced in the body than normal—ulcers and illness develop at this point. To combat this acidosis as well as the poor conditions the cattle are kept in, antibiotics are given in their feed. The meat industry makes up 70% of U.S. antibiotic use. All-in-all, a great peak into the world of corn farming and the food industry. Stellar work, King Corn! Yet another reason to look into permaculture, growing your own garden, joining a CSA and or supporting your local organic farm or farmer’s market. I highly recommend this film. Further reading on corn can be found in Michael Pollan’s The Omnivore’s Dilemma, the Farm Subsidies Database, and King Corn. 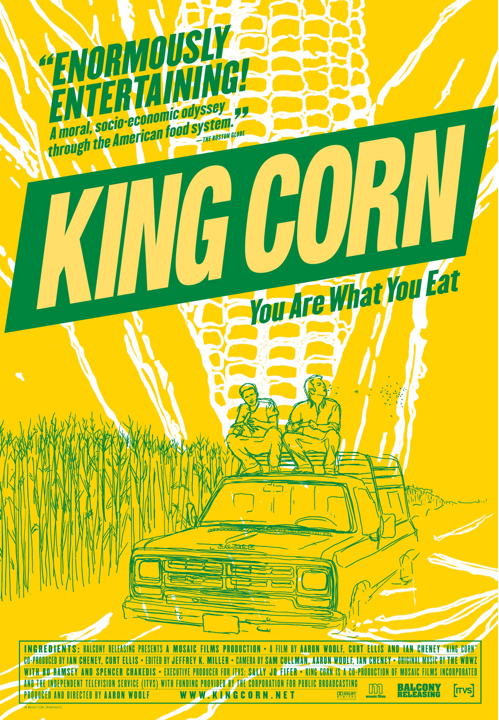 Support farmers by getting involved: Environmental Working Group and King Corn. COMING SOON: The Monsanto wars. Want to be updated on the latest? Subscribe to the feed here. Previous post: Nourishing Traditions by Sally Fallon and Mary G. Enig, Ph.D.
Next post: A Living Dress!